Deep Space Station K-7 is a Lambda Series Station that orbits Sherman's Planet in the Aldebaran Sector. Commissioned in 2426, Deep Space Station K-7 was built as a guardian outpost for the Federation Colony on Sherman's Planet. 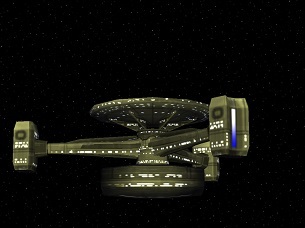 Named in honor of its predecessor, the new K-7 is a Lambda Series Station that functions in many of the same roles as its ancestor as a frontline defender against the Klingon Empire. When completed the station was placed under command of Captain Naomi Wildman. With the start of a new cold war between the United Federation of Planets and the Klingon Empire, K-7 has seen its importance grow overnight. As a frontline supply base it is anticipated to serve as a starship resupply and repair point should conflict emerge. Due to these new roles Captain Carolyn Piett was transferred to command by Starfleet Headquarters due to her experience with the Klingon Empire in early 2428. Deep Space Station K-7 has the distinction of serving as the site of a diplomatic meeting between President Gruzy and Gorn Commander Karrak shortly following the death of Klingon Chancellor Krenek, Son of Kol in 2428. The primary command and control room for Deep Space Station K-7, the Operations Center is the station's equivalent of a starship's Bridge. Expansive Cargobays are available in the Drydock area for the storage of equipment and supplies awaiting transfer to visiting vessels. Attached to the Spaceflight Terminal, the Concourse is the main shopping center for Deep Space Station K-7. Entertainment including bars, holosuites, restaurants, and shopping plazas are in this area for staff and visitors to Spacedock. Deep Space Station K-7's drydock is the largest location aboard the entire station and allows for starships to dock inside the station for repairs and replenishment as needed. Limited repairs may be provided in this drydock area. The primary point of entry for Deep Space Station K-7, the Spaceflight Terminal is one of the largest areas aboard the station. From here crew and passengers can gain entry to any vessel that is docked at the station. Security personnel are constantly on patrol in this area and screen all persons who enter and leave the station. The Lab Complex for Deep Space Station K-7 is surprisingly one of the smaller sections of the station. Due to the extreme nature of some research undertaken there most labs can be ejected from the station if the need arises in order to contain a catastrophe. The advanced sensors of Deep Space Station K-7 have been installed in this region of the station. The medical center for K-7. The Hospital Complex is the primary trauma center for the Aldebaran Sector and features capabilities to treat over 5,000 patients per day. The Hospital itself features an Ambulance Bay for medical shuttles, patient wards, psychiatric offices, and surgical rooms. Quarters are available for the medical staff in this area. Multiple apartments of varying size are available to any personnel whom have been assigned to the station long term. Large, comfortable accommodations are available to guests of the station and come in multiple sizes and bed room layouts. The Computer Core of the station is an advanced positronic based system that was recently upgraded. The emergency power systems for the station. The equivalent of Engineering on a starship, the Facility Management room is a Starbase's control center for damage control and maintenance functions. The primary energy generation center for K-7 are a series of powerful fusion reactors that have been installed in this area. The Waste Management section of the station recycles all refuse into useable materials.